Dealing with customer payments can be complicated, but with consumers preferring to pay for goods and services using a credit card, it’s vital that your business is set up for credit card authorizations. To get you started, we have a range of free samples and templates available for you to download and customize in MS Word and also resume samples. In addition to our free templates, this guide provides useful information on when to use a credit card authorization form, the associated advantages, what a form should include, and relevant legal requirements. What Information Should the Form Include? The credit card holder is not physically present i.e. they have placed an order on the Internet, over the phone, via email, or by standard mail. Verbal or written authorizations of credit card purchases, or card not present transactions, are typically used by merchants that do not have a traditional shop front e.g. airlines. Businesses that do not operate with physical point of sale infrastructure may also need to use credit card authorization forms. Credit card billing occurs in the future – At the time of transaction, the customer’s credit card is not charged, and the sale is instead pending against the cardholder’s account. These “authorization only” transactions are commonly used by hotels and car rental companies where an initial temporary charge may then be adjusted based on actual costs incurred e.g. hotel room service charges. Businesses can also use this type of transaction for customers that wish to put items on hold that are temporarily out of stock. Credit card payments are of an ongoing or recurring nature – These card on file transactions occur when the cardholder has authorized for the credit card to be used as the standing method of payment. Examples include businesses that offer subscription-based services, and prefer to automate transactions for repeat clients. Simple form without bells and whistles - a good, clean way to collect the data needed to process a transaction. Efficiency – When capturing customer and payment information, instead of having to complete and store multiple forms, you can use a single credit card authorization form. This will improve business process efficiency, and reduced documentation can simplify the organization and retention of records. Ability to build consumer trust – It’s not sufficient to write a customer’s payment details on just any old piece of paper. You need to instill confidence in the cardholder that their personal information will be secure. The first step is to use a well-designed payment authorization form that demonstrates your professionalism and commitment to proper transaction documentation. Protection against fraudulent activity – Certainly, there are security risks associated with payments using credit cards, but authorization forms are invaluable when having to address a chargeback claim. This is where the cardholder reports an unauthorized transaction and attempts to have the charges reversed. Keeping proper records of completed and signed forms also ensures that you are protected from potentially fraudulent transactions. If you are refunding a payment, make sure you issue the refund directly back to the customer’s payment card. 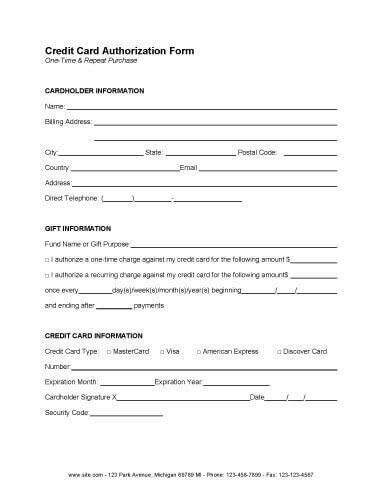 Feel free to use our Credit Card Refund Authorization Form template for this purpose. If you must make the refund via cash, check, or into a bank account, get the customer to sign a written statement that they have received the refund. The laws regarding the collection and retention of credit card information vary from state to state. To fill this legal void, a proprietary security standard, the Payment Card Industry Data Security Standards (PCI DSS), was created to provide a way of measuring and maintaining secure practices in organizations that handle cardholder information. Despite PCI compliance not being enforceable by federal law, some U.S. states refer to the PCI DSS directly. For example, in 2009, Nevada incorporated the standard into state law, requiring merchants doing business in that state to comply with the standards. Even if you are not currently required to comply with the PCI DSS, this may change in the future, and maintaining compliance with the standards is another indicator of your business’ professionalism. Many of the templates we’ve provided include a brief statement referring to the storage of credit card information. Depending on your business credit card information retention policy, this statement is something you may wish to include to allay customers’ fears around potential fraudulent activity. For in-depth information on PCI compliance as well as access to webinars, tutorials, and guidance visit the PCI Security Standards Council webpage. Whether you need to process one-off transactions or recurring payments, choose from our range of customizable samples. The below templates have been designed to suit various business sectors, including healthcare, hospitality and legal services. You’ll also find sample forms for use in various scenarios, including credit card refund authorization, membership charge authorization and fee charge authorization for Visa and Mastercard. Let your client give permission for up to four named users to make orders to be charged to a single credit card. Pay for multiple invoices in a single transaction or specify individual charges for each all in a single place. Establish an agreement to charge fees immediately upon acceptance of a client application. Comprehensive charge authorization form specifically tailored for the hospitality and event business. Perfect for travel agencies, large or small, this form conveniently combines passenger data and the related charge authorization information in one place. Elegant charge authorization form with carefully crafted language to protect both parties. Dynamic form for pre-authorization of recurring donation charges with three options for donations. Form for payment via electronic transfer from bank accounts with convenient entry for all of the necessary info. For organizations that accept gifts and donations for their ongoing maintenance with a number of options. Collect credit card information for a one-time charge or for recurring transactions; with a removable remittance slip. Use this form to combine the credit card authorization, transaction details, and client data all in one place. Add an extra layer of protection for both you and your client by requiring driver’s license information. Straightforward form that authorizes charges to an account in return for equipment rentals or services provided. Establish a general line of credit through credit card company between customer and with your business. 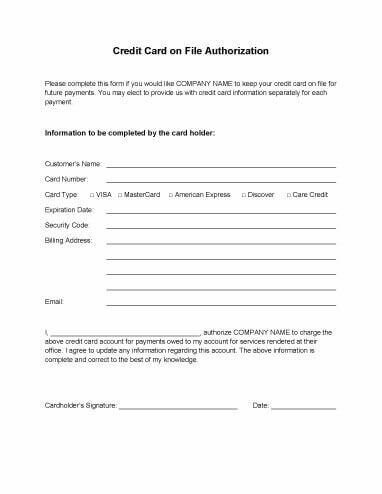 Form for establishing a standing credit card charge authorization - Care Credit or commercial credit card. Single invoice authorization or permission to bill for invoices created for future transactions. No-nonsense and highly professional looking credit card authorization template to accept credit card payments. 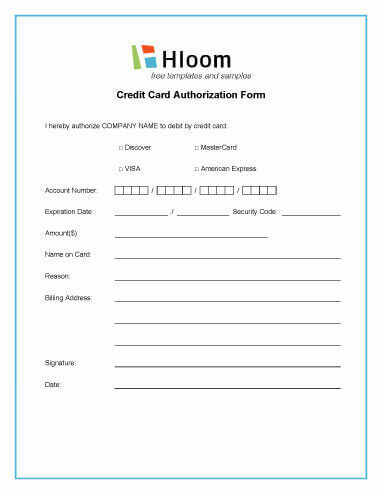 Authorization form combined with a fax coversheet for a simple all-in-one processing of a permit payment. Charge membership fees to a credit card without having to swipe the card on a reader machine. Hotel form to request front and back copies of the credit card being used to make the reservation. Designed for those working either on retainer or on a case-by-case basis (common in the legal profession). For clients with ongoing transactions: use to set up recurring charges to streamline your interactions. Simple and flexible multi-purpose generic form to tailor your transactions for whatever might come your way. This ultra-flexible form with choice of paying for a single transaction charge or an ongoing authorization. 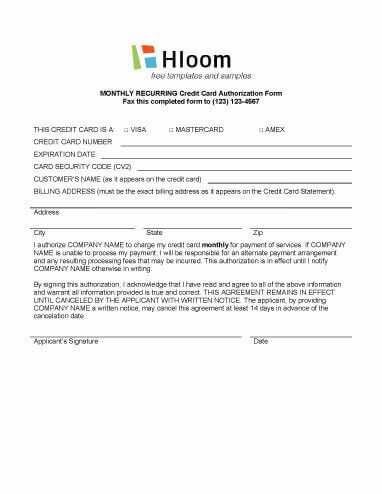 Generic ongoing credit card authorization form for online businesses - get through checkout more quickly. Quick and efficient billing for a gallery, trade show and exhibition, setting up a community craft fair. Dental, medical, legal, vision, auto and any number of other insurance types that have ongoing payments. Designed specifically to support companies providing ongoing software and service support. Make arrangements for the future with this template allowing for a flexible start date for recurring charges. This rental fee authorization form tracks both the deposit and application charge - great for renting equipment or housing. Collect information ahead of time to ensure that there’s no need to distract clients with financial details. Ensure that credit card charges are clearly understood by all parties. For employees and managers in the hospitality. Allow customers to authorize others to make limited charges to their card (i.e. allows a parent to assign limited credit to their child). Making payments for coursework and accommodations with explanation of the nature of the charges. Established customers can be billed for services they wish to give to others as gifts. Cover sheet that allows accounts receivable to understand the charge history of any student at a glance. For companies where ongoing expenses cannot always be billed completely at the time of providing the services. Organize all of the expenses that are incurred as part of client travel with a concise summary of the charges.